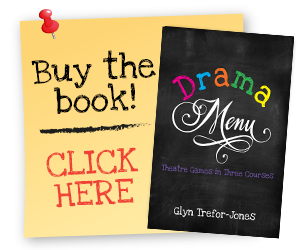 Drama Menu Drama games from Drama Menu by Glyn Trefor-Jones - A collection of theatre games, drama games, improvisation ideas, drama lesson plans and ideas for drama. I wanted to find a bunch of drama games that were physical, fun and energising for my class of 10-12 year olds who needed a big surge of energy through them and these drama games and performance piece proved very much the energising boost that they needed and it got my students using the space in a much more dynamic way than usual and the drama performance pieces and the improvisation work that came from these drama games and exercises was a real joy to see and really managed to inject energy, zing and pizzazz into the group… I hope that the lessons learnt here will serve them well and effect positively the work to come. NB -I also added a game of SPLAT after Action Names which worked well.